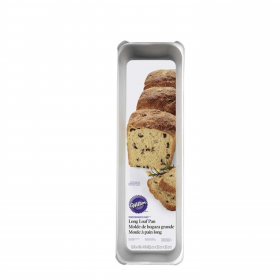 This Wilton long loaf pan makes 11 x 4 inches of bread so you don't have to make it as often. But this aluminum loaf pan is not just for baking bread. It has cooling legs for making angel food cakes, plus you can make a loaf-style pound cake, meatloaf for a crowd or even lasagna.